Acoustic Energy announces launch of 1-Series loudspeakers | What Hi-Fi? British hi-fi manufacturer Acoustic Energy has announced the launch of the 1-Series, its new range of entry-level loudspeakers, which claim to bring "audiophile performance to [the] budget market". The company says its new entry-level range is designed to capture much of the performance of its 3-Series, but at a more affordable price and more suitable for use in smaller rooms. While the 1-Series speaker cabinets are smaller in size and feature vinyl-wrap finishes, much of the design and construction is the same as the 3-Series – including the soft-dome tweeter. Acoustic Energy's signature aluminium core mid/bass drivers has also been used in the new 1-Series, as well as smooth press-construction cones that offer great speed and coherence. 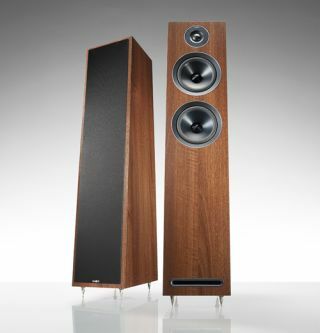 The 1-Series incorporates the 101 stand mount (£275); the 103 floorstander (pictured, £550); the 107 centre (£199) and the 108 subwoofer (£349). It is available in three finishes. The 101, 103 and 107 models both come with 28mm custom fabric dome tweeters and can handle 150W RMS (101) and 175W RMS (103 and 107) of power respectively. Meanwhile, the 108 contains a 20cm recycled pulp fibre cone and has a frequency response of 38Hz - 120Hz. It's power handling capacity is 105W active. Each model in the range is reflex loaded with a front mounted slot-port, which reduces port turbulence and has been designed to give you faster, deeper low frequency playback. The launch of the new 1-Series comes at a time when Acoustic Energy has confirmed a new distribution agreement with Henley Designs, which came into effect on January 1st, 2014.
Henley Designs will now offer sales and support for all Acoustic Energy enquiries in the UK and Ireland, including the 1-Series loudspeaker range.